Since 1992, Superlum has been manufacturing high quality Superluminescent Light Emitting Diodes (SLDs), Gain Chip Modules and Semiconductor Optical Amplifiers (SOAs). 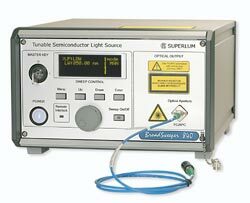 With a long history of SLD research and development, Superlum offers SLD modules at 670 – 1620 nm spectral range as well as broadband SOAs and Swept Wavelength Tunable Semiconductor Lasers at 800 – 1000 nm spectral range. 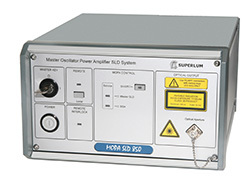 Standard modules at 660 - 1610 nm. Miniature fiber coupled modules "MiniBUT". Fiber-coupled Semiconductor Optical Gain and Amplifier modules at 780 – 1000 nm spectral range. SLD Controllers (PILOTS) for temperature stabilization and driving of SLD modules. OEM Drivers: board-level controllers for integration into OEM products. Miniature broadband light source modules. Compact broadband light source modules. M-S-series with internal optical isolators. M-T- and M-Q-series for ultra high resolution OCT. Older S- and BLM-S-series (still in production). Swept Wavelength Tunable Light Sources. MOPA-SLD-850: The first commercial 850-nm SLD-based benchtop system emitting 50 mW from PM-fiber with a smooth, low-rippled optical spectrum. We provide a lot of customized solutions based on your needs. Contact us for further information. Products that are no longer being sold. Recommended replacements are listed, if available.